Fool-proof New Zealand-English spelling and grammar tool, priced from NZ$45 a month. The technology blows MS Office's spellcheck and grammar tool away. Covers Australian and New Zealand English, British English and American English. Users could easily find themselves soon speaking inline with Grammarly's conventions and noticing common mistakes in publications they read based on the Grammarly suggestions in everyday text. Reviews are quick, logical and easy to stop and restart as corrections are made. 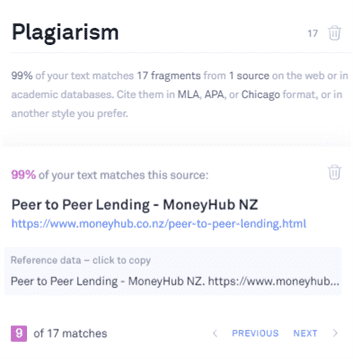 MoneyHub has used Grammarly in every publication since June 2018 and we believe it is an easy-to-use program that builds a layer of grammar that's easy to follow. Bottom Line - Is Grammarly For You? Pricing: How much is Grammarly, and is it worth the money? Nothing else offers the level of sophistication and detail - MS Word does offer anything close to the technology behind Grammarly when it comes to proofreading everyday English. Every correction suggestion comes with an explanatory note, allowing you to improve your understanding of the issue and make an informed decision about whether to fix the issue. Integrates into GMAIL, Word and Outlook, among other software and tools. 10-day refund policy; Grammarly refunds you a pro-rated portion of any pre-paid subscription unused. So if you pay for one month ($29.95) and cancel after 10 days, you will be refunded around $20. Grammarly continually flags words that repeat and suggests variations - in our experience, this is not helpful. There is no offline mode, meaning you can't correct flagged errors when you're not connected to the internet. Auto-renewal billing doesn't allow for refunds. Specifically, if you cancel after your subscription renewal date, "you will not receive a refund for any amounts that have been charged - your cancellation will be effective at the end of your then-current subscription period" per Grammarly's terms. Grammarly offers real-time grammar and spell checking, with extensive editing tools to detect and correct any defects in a sentence. No other tool comes close. The annual price (USD 139.95, or USD 239.80 if paid quarterly) is a big commitment - while sign-up discounts exist (see pricing)​, users would need to be making regular use of the tool to realistically receive value for money from their purchase. With a desktop version, website version, Chrome (and other browsers) add-on and MS Office plugin, Grammarly works in multiple places across your workflow. In a simple test, we ran the spelling and grammar tools of both Word and Grammarly through a poorly worded sentence. Grammarly Free: Because spelling and grammar correction come standard with the free version of Grammarly, the tool is infinitely more useful than Word. In the example above, it detected every error and provided helpful explanations as to why a change should be made. MS Word: While the tool failed all tests, it's arguably still better than nothing. Like Grammarly, it also has settings for regional uses of English. For spelling and grammar checking, there is little difference between the free and premium versions of Grammarly. Both correctly identify spelling errors, long-worded phrases and poor grammar. Grammarly Premium's advanced editing tools, explained in detail below (Grammarly walkthrough) take proofreading to a new level and are highly useful. How much is Grammarly, and is it worth the money? 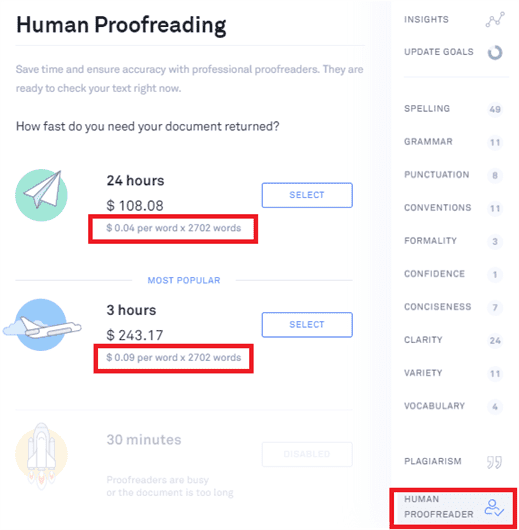 Grammarly Premium costs between 11.66 and 29.95 USD per month, depending on how long you sign up for. There is no regional pricing - payments made in New Zealand dollars or any other currency are converted to USD at the current exchange rate at the time of purchase. By signing up to the free version of Grammarly, not only will you get used to the tool but within days you will be invited to purchase Grammarly Premium at a substantial discount. In our experience, a team member's personal GMAIL inbox received many offers to sign up, offering 40% to 50% off. Is Grammarly worth the money? It's easy to miss mistakes; Grammarly’s automated proofreader flags an extensive range of errors and ultimately provides a backup option for tired eyes. 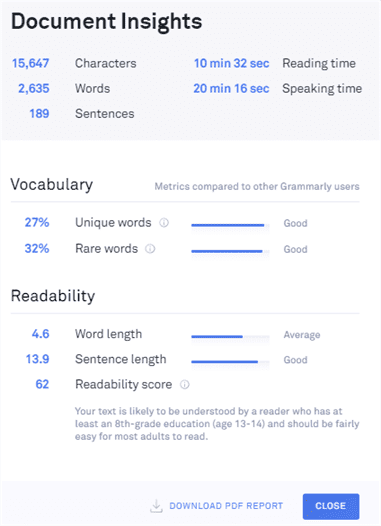 Grammarly eliminates time otherwise spent rereading and rewriting with a laser focus on areas which need improvement. However, before signing up for an annual program, make sure it's going to pay off for your everyday work or study. For a specific purpose such as writing a paper or report, a monthly subscription may be sufficient. The best way to see how Grammarly works and how accurate it is is to walk through a sample of the tool. MoneyHub uses Grammarly to proof all draft pages as part of our internal review process. While we have our editorial team, we noticed that deploying Grammarly before internal reviews led to a considerable reduction in their workload. In the following screenshots, we outline how Grammarly works, its benefits, its shortcomings and how it can best be used for everyday written communication. Please note, this review looks primarily at Grammarly Premium, the paid service - the free version (we call this 'Free Grammarly') only detects spelling and grammar errors, as outlined below. MoneyHub's team of writers use Grammarly multiple times per day. The examples below are indicative of standard use, but do not confirm any degree of accuracy. Every user's needs are unique and Grammarly may not be appropriate for some needs. Our view is this - just because Grammarly suggests it doesn't mean it's correct - challenge every correction flagged to get the best outcome. 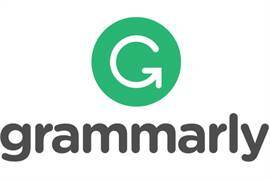 All content previously analysed by Grammarly is stored on your online editing account for reference. When you log in, simply clicking "New" prompts you to upload. Once analysed, you are presented with suggested corrections which you can accept (or ignore) one by one. 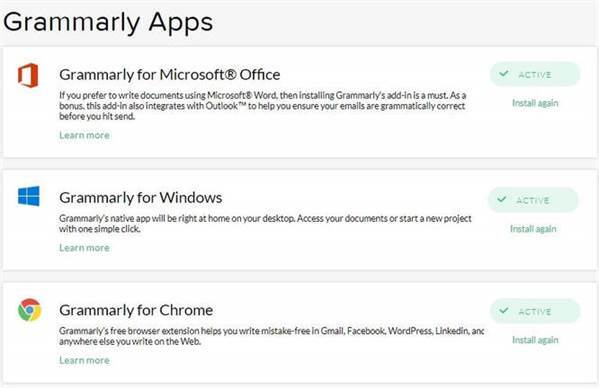 If you work in Word, Excel, PowerPoint or any other Office product, you can download the MS Office Grammarly add-in where content is directly analysed within your file. If you use GMAIL, Yahoo etc, the Grammarly Chrome app will check spelling and grammar as you type in Chrome. There are also extensions for Firefox, Safari, and Edge. Grammarly's online editor makes it easy to paste content into the tool. However, all formatting is removed (bold/italic, links, spacing etc), so if you're taking content from a webpage or custom file, you will need to make updates directly onto your file as Grammarly runs through its suggested corrections. 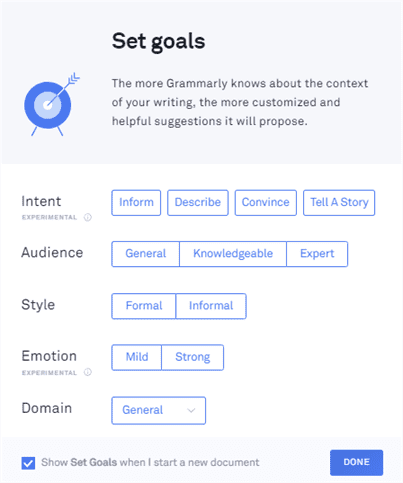 After pasting in the content, Grammarly asks the goals of the document. As a rule, we always tick the boxes of 'inform', 'general', 'formal', 'mild' and 'general' which best reflects our readership base. However, every user is different and Grammarly's suggestions will vary based on your goals. In our experience, selecting 'informal' as a style means far less potential errors are flagged. Formality - If you've selected 'formal' under writing style. Grammarly will detect the use of words that it believes are informal - 'and/or' being a primary example. Grammarly takes you through each class of correction at a time. So you will correct spelling errors first, then grammar issues, then punctuation, and so on. To indicate the common corrections Grammarly highlights, we have presented a list below under each class. Grammarly detects the misuse or overuse of indefinite articles; in this case 'a different travel insurance' should be 'different travel insurance', which is Grammarly's suggestion. Grammarly detects when a word is misused - in this case 'reputation of paying' makes better sense as 'reputation for paying', and Grammarly appropriately suggests this. If you make a mistake and use the wrong word, Grammarly picks it up - 'are lot' should be 'a lot'. Grammarly raises issues with any words that it feels can be replaced with more natural choices - in this case "remaining" is suggested as a replacement for "unused"
Grammarly isn't the strongest when it comes to suggesting word varieties - with technical writing, the chance of a useful suggestion is even lower. Word varieties are raised when Grammarly believes a word has been overused and there are alternatives. In our view, this has proven to be the least helpful and least accurate tool. Once all checks are complete, Grammarly confirms with a concluding statement as indicated above. There are further optional steps, outlined below. 1. The plagiarism tool scans the internet and flags any duplicate content. In our testing, this tool has proven to be accurate with detection from only a few words. 2. Human proofreading is an optional service whereby a Grammarly staffer manually proofreads your text. The faster you want it, the more you pay, with rates from 4 to 9 cents per word. However, proofreaders do not reorganise, restructure, or rewrite the text. The purpose of the service is to give an assurance there are no spelling or grammatical mistakes. 3. Document insights is a feature which gives a summary of each text, a score on multiple fields, reading time and readability.